Nellie was the first to step ashore in Colombo. Leaving the other passengers boarding a steam launch, she balanced on an outrigger that sped towards the small island once known as Ceylon. 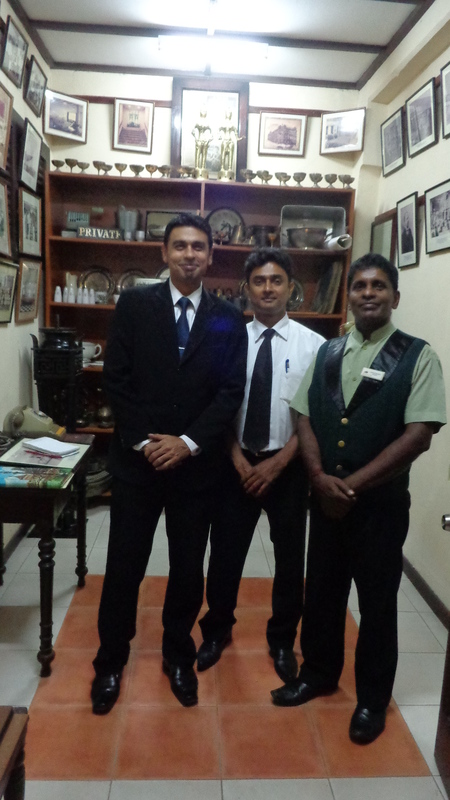 Grand Oriental Hotel Museum with (l to r) Mr. Chandika, Mr. Nandana and Mr. Dushaatha. One of them was the Grand Oriental Hotel. Nellie had already engaged her accommodations there when the steam launch arrived with the others. My own accommodations at the Grand Oriental Hotel were ‘engaged’ on the internet a month in advance. I’d hoped to stay in the same room as Nellie; but records of her stay no longer exist. I was also greeted with a cooling fruit juice when I arrived at the Grand Oriental for the Asian start of my Nellie Bly 125th anniversary world trip. With an exasperating five-day delay between ships, Nellie became well acquainted with the hotel. In her day, the corridors were ‘colonised’ by snake charmers, magicians and jewellers. They have long since disappeared — and so has much of the charm that once characterised the Grand Oriental. Only 80 of the original 300 rooms remain – the rest were sold for police headquarters. Even so, the management is fiercely proud of the hotel’s legacy – it’s a listed site. The multitude of plaques in the lobby attest to the glorious heritage of the Grand Oriental Hotel, including a visit by Anton Chekov in 1890, a year after Nellie’s. What’s missing is a tribute to Nellie. Perhaps I should arrange a plaque commemorating her stopover. I think they would make space in the lobby; or perhaps in the hotel’s little museum on the fourth floor where it could take its place among the time-honoured photos, ledgers, crockery and silver from the Grand Oriental’s past. Sri Lanka is known for its hospitality and I experienced it big-time. A simple introduction by email from a mutual friend in London was all it took for Lakmini Raymond and her two sons Jévon and Devin to share their local knowledge, their home and their friendship. We started with a cup of famous Ceylon tea in the former Dutch Hospital — there even before the British arrived – now a dynamic mix of trendy shops and eateries. From there we relaxed in Lakmini’s home near that of the Sri Lankan Prime Minister; before dinner at the Hilton which was also hosting the Japanese Premier in the country to inaugurate a second terminal at the Bandaranaike International Airport as I discovered upon landing there that morning. 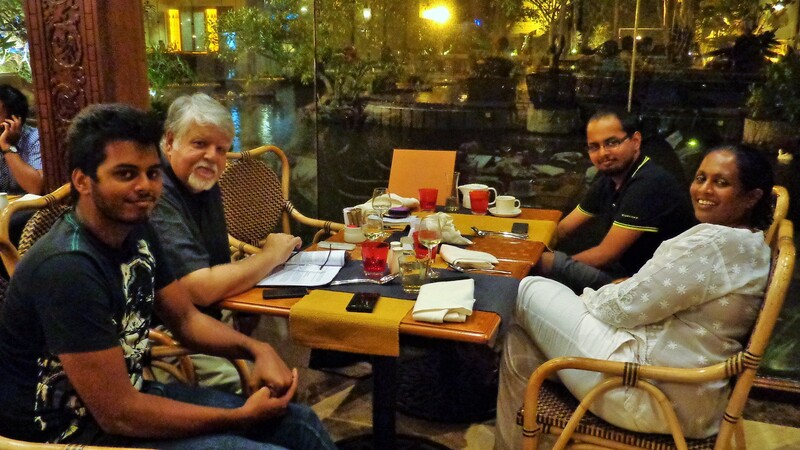 The Nellie Bly Research Team in Colombo — Lakmini, Jevon and Devin Raymond and Jagdesh Mirchandani. 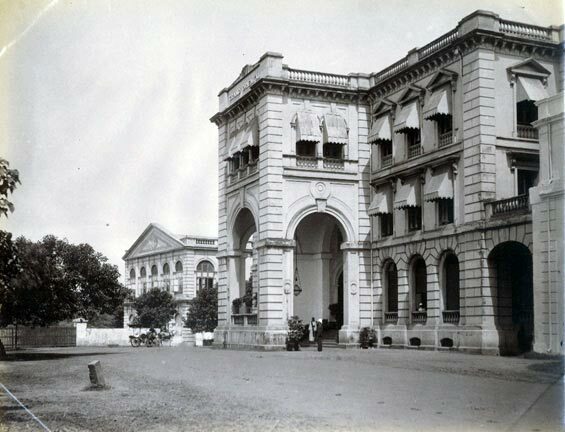 Some of the sites Nellie visited in Colombo were evident, but Lakmini, her sons and friend Jagdesh Mirchandani formed the ‘Nellie Bly journey research team’ and managed to connect the current-day Ananda College with the Buddhist College Nellie visited 125 years ago. The big challenge was the Parsee Theatre where Nellie attended a theatrical performance so memorable that she spent two pages of her short book describing it. Even Jagdesh, whom Lakmini calls the Wikipedia of Sri Lanka, didn’t know. “Let’s ask a Parsee he said as he dialled a Parsee friend. We’re still not sure but Jagdesh’s friend thought it could have been at the Parsee Club under the pergola. And that was day one in Sri Lanka. Nellie’s story idea to race round the globe faster than Phileas Fogg sat on The New York World newspaper editor’s desk for a year. Suddenly on 12 November 1889 Nellie was asked if she could start her journey ‘the day after tomorrow.” I can start this minute,” she said. When Nellie first introduced her ’round the world’ feature idea, her editor insisted that ‘only a man’ could do it. Nellie told him to assign a male; but she would take her idea to another paper and win the race. He conceded. In Nellie’s day, no-one would send a young woman to the far corners of the earth without a chaperone. In any case, the numerous trunks required by a female traveller would prevent the speedy connections necessary to win the race. Nellie took a small satchel (17.8 x 40.6 cms) and wore the same dress throughout the journey. “One never knows the capacity of an ordinary hand satchel until dire necessity completes the exercise of all one’s ingenuity to reduce everything to the smallest possible compass,” she said. She could have packed lighter. But don’t forget your camera “The only regret of my trip, and one I could never cease to deplore, was that in my hasty departure, I forgot to take a Kodak.” Take (even more) risks Nellie was only eight days into the race when she received word that Jules Verne, the author that inspired her own voyage with his novel Around the World in 80 days, wanted to meet her at his home in Amiens, France. That would require a time-guzzling deviation threatening her success right from the start, not to mention two nights without sleep. She did it. 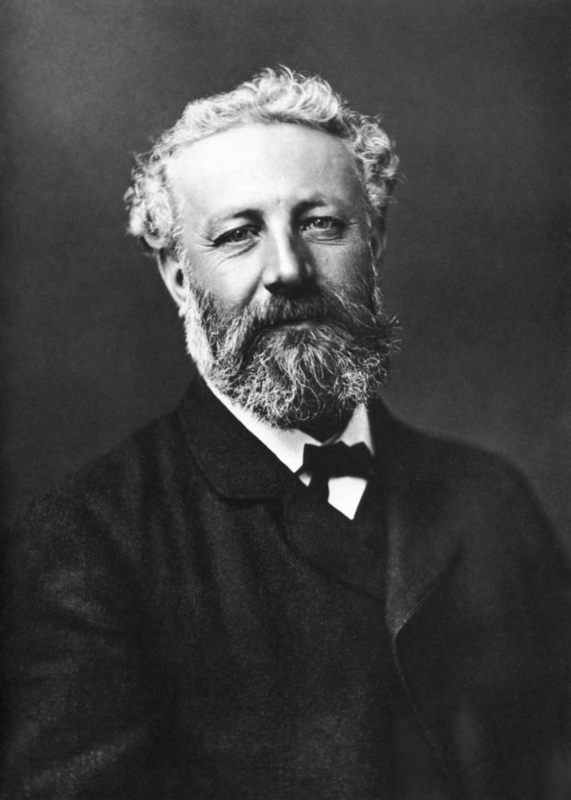 “Before I had been many minutes in their company, they had won my everlasting respect and devotion,” Nellie said of Jules Verne and his wife Honorine. The feeling was mutual. Nellie’s visit lives on today in photos and references found in their home, Maison Jules Verne, now a first-rate museum attracting visitors from around the world. You can see where she had tea with the Vernes and view his study, just as it was when Nellie visited. Believe in humanity Nellie was encouraged to carry a revolver on her travel for protection. She refused. Nellie acquired a monkey in Singapore that she named McGinty. McGinty travelled half-way round the world with Nellie, causing chaos on board; and later in her home.